Since early 2016 work has been underway to restore the old Victorian walled garden. Using volunteer labour, we plan to reintroduce heritage varieties of fruit and vegetables where possible using traditional tools and skills to provide fresh, organic food for our table. Working with Minsteracres community member Lya Vollering, environmental consultant Andrew Pennington is overseeing the restoration of the old Victorian walled garden. 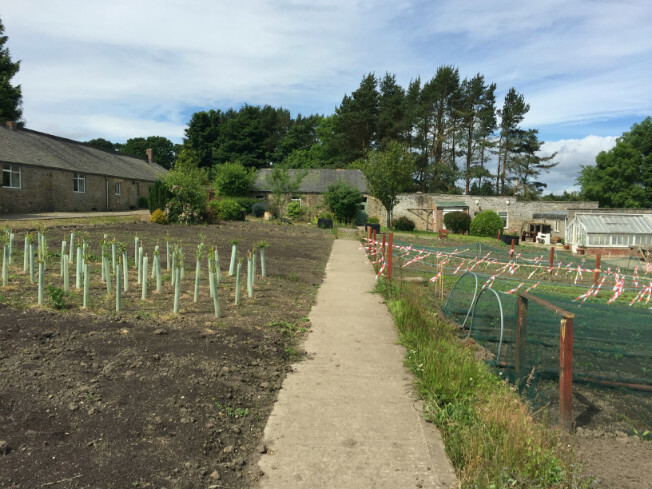 Together with volunteers they are refurbishing the old greenhouse, restoring the original footpaths and planning to plant heritage trees and crops using traditional methods with the aim that resident community at Minsteracres could become self-sufficient in food production. This organic garden will house bees to help with pollination and employ companion planting, using one type of plant to attract harmful bugs away from another food crop, and other plants to enrich the soil.